Rubies are a rare resource which allows you to increase all aspects of your production. Accumulating them will unlock new upgrades and trophies, providing both a permanent passive bonus and the ability to spend them to purchase new perks. Rubies persist through Abdications and Reincarnations. 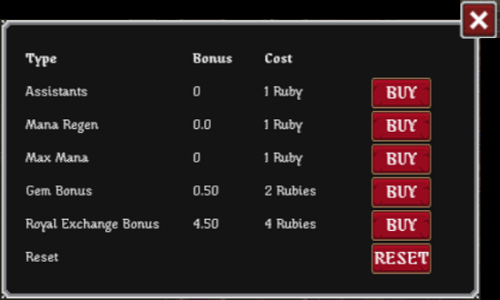 Prior to "The Secrets of the Ancients" expansion, Rubies were only available in the shop. Since then, Rubies can also be found for free by excavating. Along with coins, Faction coins and gems, Rubies are another kind of currency. They enable you to buy special items that cannot be bought otherwise. You can either buy Rubies in the shop, find free Rubies at Events, or by excavating. You can buy an unlimited number of Rubies, or you can excavate for them but they get progressively harder to find. The formula for the number of excavations required for each ruby is 25n(n+1), where n is the number of rubies. Finding the 1st, 10th, 25th and 50th ruby rewards a trophy. Excavation Resets : Costs 1 Ruby - 1-2999, 2 Rubies 3000-5999, 3 Rubies 6000-8999, 4 Rubies 9000-11999, 5 Rubies 12000-14999. Note: The counter is reset, but you will not find rubies again. Finding 1 Ruby will unlock the Ruby power upgrade which unlocks The Power of Rubies. Ruby power bonus will also increase by Tier based on all-time amounts of Rubies collected. See Ruby Upgrades for more details. All Ruby upgrades have both an additive and a multiplicative bonus. All ruby upgrades persists through Abdications and Reincarnations. Bonus Reset 1 Ruby Reset all the ruby upgrades to 0 and get all your rubies back. 1 1 Coin 50 Rubies Increases ruby power by 100% to 200%. 58 rubies can be purchased in the Shop for 125 kreds. 160 kreds for $15 with 35 kreds extra. 2 1 Coin 100 Rubies Increases ruby power 100% to 300%. 104 rubies can be purchased for 200 kreds. 225 kreds for $20 with 25 kreds extra. 3 1 Coin 150 Rubies Increases ruby power 100% to 400%. 152 rubies can be purchased for 300 kreds. 335 kreds for $30 with 35 kreds extra. 4 1 Coin 250 Rubies Increases ruby power 200% to 600%. 280 rubies can be purchased for 500 kreds. 500 kreds for $45 with 0 kreds extra. 5 1 Coin 350 Rubies Increases ruby power 200% to 800%. 350 rubies can be purchased for 650 kreds. 675 kreds for $60 with 25 kreds extra. 6 1 Coin 450 Rubies Increases ruby power 200% to 1000%. 454 rubies can be purchased for 850 kreds. 900 kreds for $80 with 50 kreds extra. 7 1 Coin 550 Rubies Increases ruby power 200% to 1200%. 560 rubies can be purchased for 1000 kreds. 1015 kreds for $90 with 15 kreds extra. 8 1 Coin 650 Rubies Increases ruby power 200% to 1400%. 664 rubies can be purchased for 1200 kreds. 1200 kreds for $105 with 0 kreds extra. 9 1 Coin 800 Rubies Increases ruby power 300% to 1700%. 800 rubies can be purchased for 1475 kreds. 1485 kreds for $130 with 10 kreds extra. 10 1 Coin 950 Rubies Increases ruby power 300% to 2000%. 954 rubies can be purchased for 1725 kreds. 1765 kreds for $155 with 40 kreds extra. 11 1 Coin 1100 Rubies Increases ruby power 300% to 2300%. 1120 rubies can be purchased for 2000 kreds. 2050 kreds for $180 with 50 kreds extra. 12 1 Coin 1250 Rubies Increases ruby power 300% to 2600%. 1256 rubies can be purchased for 2275 kreds. 2300 kreds for $200 with 25 kreds extra. 13 1 Coin 1400 Rubies Increases ruby power 300% to 2900%. 1400 rubies can be purchased for 2500 kreds. 2525 kreds for $220 with 25 kreds extra. 14 1 Coin 1600 Rubies Increases ruby power 400% to 3300%. 1608 rubies can be purchased for 2900 kreds. 2915 kreds for $255 with 15 kreds extra. 15 1 Coin 1800 Rubies Increases ruby power 400% to 3700%. 1806 rubies can be purchased for 3250 kreds. 3250 kreds for $285 with 0 kreds extra. 16 1 Coin 2000 Rubies Increases ruby power 400% to 4100%. 2008 rubies can be purchased for 3600 kreds. 3610 kreds for $315 with 10 kreds extra. 17 1 Coin 2200 Rubies Increases ruby power 400% to 4500%. 2200 rubies can be purchased for 3975 kreds. 4015 kreds for $350 with 40 kreds extra. 18 1 Coin 2400 Rubies Increases ruby power 400% to 4900%. 2402 rubies can be purchased for 4325 kreds. 4350 kreds for $380 with 25 kreds extra. 19 1 Coin 2650 Rubies Increases ruby power 500% to 5400%. 2656 rubies can be purchased for 4775 kreds. 4825 kreds for $420 with 50 kreds extra. 20 1 Coin 2900 Rubies Increases ruby power 500% to 5900%. 2904 rubies can be purchased for 5200 kreds. 5215 kreds for $455 with 15 kreds extra. 21 1 Coin 3150 Rubies Increases ruby power 500% to 6400%. 3150 rubies can be purchased for 5650 kreds. 5665 kreds for $495 with 15 kreds extra. 22 1 Coin 3400 Rubies Increases ruby power 500% to 6900%. 3408 rubies can be purchased for 6100 kreds. 6135 kreds for $535 with 35 kreds extra. 23 1 Coin 3650 Rubies Increases ruby power 500% to 7400%. 3650 rubies can be purchased for 6525 kreds. 6540 kreds for $570 with 15 kreds extra. 24 1 Coin 3900 Rubies Increases ruby power 600% to 8000%. 3920 rubies can be purchased for 7000 kreds. 7010 kreds for $610 with 10 kreds extra. 25 1 Coin 4200 Rubies Increases ruby power 600% to 8600%. 4200 rubies can be purchased for 7500 kreds. 7515 kreds for $655 with 15 kreds extra. 26 1 Coin 4500 Rubies Increases ruby power 600% to 9200%. 4502 rubies can be purchased for 8050 kreds. 8050 kreds for $700 with 0 kreds extra. 27 1 Coin 4800 Rubies Increases ruby power 600% to 9800%. 4808 rubies can be purchased for 8600 kreds. 8615 kreds for $750 with 15 kreds extra. 28 1 Coin 5150 Rubies Increases ruby power 600% to 10400%. 5154 rubies can be purchased for 9225 kreds. 9250 kreds for $805 with 25 kreds extra. 29 1 Coin 5500 Rubies Increases ruby power 600% to 11000%. 5504 rubies can be purchased for 9875 kreds. 9875 kreds for $860 with 0 kreds extra. 30 1 Coin 5850 Rubies Increases ruby power 700% to 11700%. 5880 rubies can be purchased for 10500 kreds. 10510 kreds for $915 with 10 kreds extra. 31 1 Coin 6200 Rubies Increases ruby power 700% to 12400%. 6208 rubies can be purchased for 11100 kreds. 11140 kreds for $970 with 40 kreds extra. 32 1 Coin 6550 Rubies Increases ruby power 700% to 13100%. 6554 rubies can be purchased for 11725 kreds. 11725 kreds for $1020 with 0 kreds extra. 33 1 Coin 6900 Rubies Increases ruby power 700% to 13800%. 6904 rubies can be purchased for 12375 kreds. 12400 kreds for $1080 with 25 kreds extra. 34 1 Coin 7300 Rubies Increases ruby power 700% to 14500%. 7302 rubies can be purchased for 13050 kreds. 13100 kreds for $1140 with 50 kreds extra. 35 1 Coin 7700 Rubies Increases ruby power 800% to 15300%. 7712 rubies can be purchased for 13800 kreds. 13800 kreds for $1200 with 0 kreds extra. 36 1 Coin 8100 Rubies Increases ruby power 800% to 16100%. 8120 rubies can be purchased for 14500 kreds. 14525 kreds for $1265 with 25 kreds extra. 37 1 Coin 8500 Rubies Increases ruby power 800% to 16900%. 8504 rubies can be purchased for 15200 kreds. 15225 kreds for $1325 with 25 kreds extra. 38 1 Coin 8900 Rubies Increases ruby power 800% to 17700%. 8910 rubies can be purchased for 15950 kreds. 15965 kreds for $1390 with 15 kreds extra. 39 1 Coin 9350 Rubies Increases ruby power 800% to 18500%. 9354 rubies can be purchased for 16725 kreds. 16775 kreds for $1460 with 50 kreds extra. 40 1 Coin 9800 Rubies Increases ruby power 900% to 19400%. 9800 rubies can be purchased for 17500 kreds. 17525 kreds for $1525 with 25 kreds extra. 41 1 Coin 10250 Rubies Increases ruby power 900% to 20300%. 10254 rubies can be purchased for 18350 kreds. 18400 kreds for $1600 with 50 kreds extra. 42 1 Coin 10700 Rubies Increases ruby power 900% to 21200%. 10710 rubies can be purchased for 19150 kreds. 19190 kreds for $1670 with 40 kreds extra. 43 1 Coin 11150 Rubies Increases ruby power 900% to 22100%. 11150 rubies can be purchased for 19950 kreds. 20000 kreds for $1740 with 50 kreds extra. 44 1 Coin 11650 Rubies Increases ruby power 900% to 23000%. 11654 rubies can be purchased for 20850 kreds. 20860 kreds for $1815 with 10 kreds extra. 45 1 Coin 12150 Rubies Increases ruby power 1000% to 24000%. 12154 rubies can be purchased for 21725 kreds. 21765 kreds for $1895 with 40 kreds extra. 46 1 Coin 12650 Rubies Increases ruby power 1000% to 25000%. 12658 rubies can be purchased for 22625 kreds. 22640 kreds for $1970 with 15 kreds extra. 47 1 Coin 13150 Rubies Increases ruby power 1000% to 26000%. 13160 rubies can be purchased for 23500 kreds. 23500 kreds for $2045 with 0 kreds extra. 48 1 Coin 13650 Rubies Increases ruby power 1000% to 27000%. 13658 rubies can be purchased for 24425 kreds. 24425 kreds for $2125 with 0 kreds extra. 49 1 Coin 14200 Rubies Increases ruby power 1000% to 28000%. 14208 rubies can be purchased for 25400 kreds. 25410 kreds for $2210 with 10 kreds extra. 50 1 Coin 14750 Rubies Increases ruby power 1100% to 29100%. 14768 rubies can be purchased for 26400 kreds. 26450 kreds for $2300 with 50 kreds extra.